A year ago the mad titan made his appearance in the battle royale of Epic Games for the premiere of the Avengers: Infinity War. Now as the Endgame approaches we could see the Thanos back in Fortnite. According to the data miner’s findings, the return of Thanos in the Battle Royale is very much possible in the coming weeks. 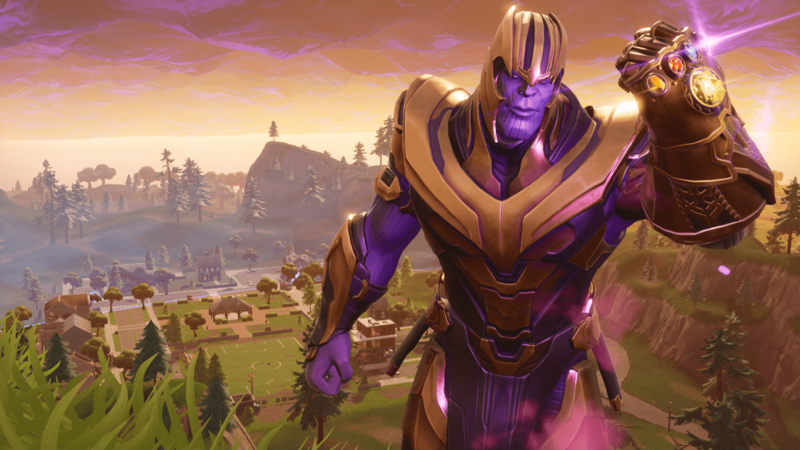 The last time that Thanos appeared in the lands of Fortnite, he was accompanied by his Infinity Gauntlet. When a player found it, he/she became the titan and their powers increased exceptionally. The player had the option of throwing a powerful laser to kill their opponents. In addition, after becoming the mad titan you got a great boost in your health and shield. Lastly, as a disadvantage, you could not build anything, yet Thanos was capable of winning games single-handedly. Will he return this time with the same mechanics? Epic Games has not announced anything officially, but data miners rarely fail their discoveries. This time, the user Skin-Tracker has published a tweet with very interesting data. Among what he has found, we can highlight the lines of text in which Thanos is mentioned. In the images, we can read «[player] succumbed to the power of Thanos [player]». Other references are made to “unleash hell” on other players. It seems pretty clear that Thanos has something to do with it. The user found this data in the last update of Fortnite, so it is unlikely that they are text lines of the previous event of the titan. We believe that Epic Games and Marvel have got back in touch to promote the new movie of the Avengers. The movie will release on April 26, so the return of Thanos should be quite close. Do you feel like putting on the Infinity Gauntlet to subdue all your opponents? Let us know. Apart from the arrival of Thanos, you might get a new mode in Fornite in the coming weeks. A temporary Reverse Gun Game mode will appear in the Royal Battle. This was reported by an insider FortTory, who tweeted screenshots from the game menu. According to the description, the Reverse Gun Game resembles a similar mode of Call of Duty. In the mode, all participants of the match start the game with the same weapon, and its power decreases with each kill. The winner will be the one who first passes the entire chain of the downgrade, from the most powerful weapon to the weakest. Judging by the data miner screen, the new mode is designed for one person. Currently, the arrival of the mode in the game is unknown. You gotta love the data miners for all of their hard work. These guys dig deep into the game files to reveal the content that the developers try to hide from us. In this way, we know what changes we will get in the game. The developers might hate the data miners, but we love them for all the great content.